Polychaetes are segmented marine worms with body segments separated by a complete or incomplete septum. In most polychaetes the whole body cavity is filled with gametes during the breeding season. Platynereis dumerilii (Pl. dumerilii), which has an incomplete septum was shown to develop a single gonadal structure for gamete production located in the neck region. However, in Perinereis nuntia (Pe. nuntia), which has a complete septum separating each segment, the developmental feature of gametes remains unknown. To clarify this, the marker gene vasa was used to trace the development of germ cells throughout the life stages of Pe. nuntia. In three-segmented juveniles, Pn-vasa was expressed in the parapodia and in the two cells localized in the pygidium. During the addition of a new segment, Pn-vasa positive cells in the pygidium increased from two to four and two new Pn-vasa positive cells were found in the newly-generated segment. In adults, Pn-vasa was expressed in a large cell cluster at the distal end of the parapodia, in smaller cell clusters (which had an elongated form in the trunk area of the parapodia), and in oocytes in the coelomic cavity. This may suggest that germ cells settle in the parapodia and later translocate into the coelomic cavity to develop into oocytes. Our observations will help in understanding the mechanism of germ cell development in all body segments of Pe. nuntia. We hypothesize that primordial germ cells are supplied from the pygidium to every newly-generating segment which later settle in the parapodium. This will explain how polychaetes can generate gametes in each body segment, even those that are independently separated with a complete septum. Annelids, the segmented worms, are one of the largest and most widely distributed animal phyla. Recent phylogenetic reconstruction of this phylum shows Chaetopteridae, Myzostomida, and Sipuncula branching off from the basal nodes, while the remaining taxa are classified into two clades: Errantia and Sedentaria [1, 2]. On the basis of this reconstruction, the ancestral annelid is characterized by a serial division of the body into numerous similar structures also known as homonomous segmentation [1, 3, 4]. Besides segmentation, the presence of a pygidium, pygidial cirri, biramous parapodia and large prostomium are characteristics of the basal taxa . The Nereidid polychaetes (belonging to Errantia) are benthic marine worms that show an interesting strategy of reproduction through a process called epitoky. This process involves the transformation of an immature worm (atoke) into a sexually mature form (epitoke) with specialized swimming and sensory ability which increase the chances of reproductive success [5–7]. All body segments of the epitoke are completely filled with gametes which are released during reproductive swimming. This unique reproductive strategy has caught the attention of many biologists working on Nereidids, making it a model animal for reproductive studies. The reproductive biology of the Nereidids has long been studied not only for the biological aspects but also for the conservation and propagation of the species [6–11]. However, most studies are limited to only a few Nereidid species and mostly focus on Platynereis dumerilii (Pl. dumerilii). Platynereis dumerilii has currently emerged as the leading model animal in the clade Errantia and is described as a homonomous segmented species [1, 3] but with incomplete inter-segmental septa . A recent study using a molecular germline marker to trace gamete generation in this species showed that germ cells originate from the mesodermal posterior growth zone (MPGZ) and migrate into the anterior segments to form a transverse cluster of cells in the neck region. This region was then referred to as the primary gonad which produces gamete to fill a large part of the body . Unlike the well-studied Pl. dumerilii, the gamete production mechanism in other Nereidid groups, that have body segments separated by complete inter-segmental septa, has never been identified. This group of polychaetes may have developed some unique mechanisms for gamete production in each body segment, which are different from that of Pl. dumerilii. Further study of this mechanism, together with the mechanism already observed in other groups with incomplete septa such as Pl. dumerilii, will provide a better understanding of the ancestral mechanism of gamete production in Annelids. Our results suggest a new mechanism for gamete production in Pe. nuntia, using vasa as a putative germ cell marker. The Pn-vasa signal was detected in all body segments during the growth of Pe. nuntia from larva to adult. The site of expression changed from the distal end of the parapodium to the inner coelomic cavity in accordance to the growth of segments. We hypothesize that primordial germ cells (PGCs) are supplied from the pygidium to every newly-generating segment. The Nereidid polychaete worms, Pe. nuntia, were purchased from the commercial hatchery in Oita Prefecture, Japan. They were maintained in the Kyushu University Fishery Research Laboratory based on the culture methods employed by the hatchery. Embryos that were raised in plastic containers supplied with running filtered seawater were observed during their developmental stages as described in  and . The identification of this species was based on the taxonomic descriptions provided by Glasby and Hsieh . The total RNA was extracted from the unfertilized eggs of Pe. nuntia using the RNeasy Plant Mini kit (Qiagen). The complementary DNA was generated from this RNA using a PrimeScript RT-PCR kit (Takara). Two degenerate primers (forward: 5′-atcaactttgacaaatacga-3′; reverse: 5′-gcgctgaacatsagygtctg-3′) were designed based on the Pdu-vasa mRNA sequence reported by Rebscher et al. (Genbank Acc. No. AM048812.1). Primers were designed corresponding to the highly conserved regions within the coding region of the vasa transcript. The resulting PCR product (619 bp) was cloned into pGEMT-easy vector (Promega) and sequenced. Homology searches were performed using BLASTn in the NCBI database. Molecular phylogenetic analysis was performed as follows: Related sequences were retrieved from public databases based on BLAST searches and prior knowledge. Multiple alignments of related amino acid sequences were created and a phylogenetic tree was constructed by maximum likelihood using the WAG + I model selected by the Akaike Information Criterion. Alignment, model selection and tree construction was performed with MEGA 5.0 . Five hundred bootstrap pseudo-replicates were performed to evaluate the confidence for each node. PL10 genes from various groups of species were included in the analysis as an out-group. Pn-vasa plasmid clones were used as a template to synthesize both sense and anti-sense RNA probes by in vitro transcription using the DIG RNA labeling kit (Roche). Juveniles and adult worms were relaxed for 2–5 min in 0.3 % ethylene glycol monohexyl ether in seawater and then fixed overnight at 4 °C in 4 % formaldehyde in phosphate buffered saline (PBS). The fixative was rinsed off by washing twice with PBS, and specimens were dehydrated in a series of methanol in PBS and stored in −20 °C until use. Whole-mount in situ hybridization was performed as described in the polychaete Chaetopterus  with some modifications. Embryos and larvae were treated in the same way as the juvenile and adult worms except that anesthetic was omitted. Proteinase K treatment was reduced from 20 min at 37 °C in juveniles and adults to 5 min at room temperature in embryos and 10 min at room temperature in larvae. After in situ hybridization, an immuno-reaction was induced using the anti-DIG alkaline phosphatase conjugated Fab fragment (Roche) and visualized by the corresponding substrate, Nitro Blue Tetrazolium/5-Bromo-4-chloro-3-indolyl phosphate (NBT/BCIP). Hybridized adult worms were fixed with 4 % paraformaldehyde overnight at 4 °C, dehydrated in series of ethanol, embedded in the paraffin and sliced into 7 μm thick sections. The sections were then deparaffinized, mounted, analyzed and photographed under the microscope. Another set of adult worm samples were also prepared for normal hematoxylin and eosin (H and E) stain following the same procedure as mentioned above, except that samples were fixed with Davidson’s fixative instead of 4 % paraformaldehyde. To determine the spatial and temporal expression patterns of Pn-vasa in the Nereidid Pe. nuntia at different developmental stages, we performed a whole-mount in situ hybridization experiment using vasa as a molecular germline marker. Vasa is an ATP-dependent RNA helicase gene of the DEAD-box family, essential for germ cell development [18–23]. This gene was originally identified in Drosophila and was revealed to have a highly conserved role among different organisms [24–39]. Since then, vasa has been used as a molecular marker to study germ cell development in many animals including polychaetes [13, 32–34]. To date vasa expressed not only in germ cells but also in somatic stem cells as well [40–42]. A 619 bp cDNA fragment was amplified, cloned and sequenced from the unfertilized egg of the mature worm and used as an anti-sense probe for the in situ hybridization experiment. The amino acid sequence showed 90 % identity to a previously reported complete sequence of Pl. dumerilii vasa mRNA  and more than 60 % sequence identity to other known vasa homologues from different annelid species such as in Urechis unicinctus (JQ665715.1), Capitella teleta (BK006523.1), Enchytraeus japonensis (AB306293.1) and Tubifex tubifex (AB257139.1). Molecular phylogenetic analysis showed that Pn-vasa formed a monophylogenetic clade with vasa homologues of other species and was closely related to the DEAD box helicase PL10 genes (Fig. 1). In the adult Nereidid polychaete worm, Pn-vasa mRNA was detected in the dorsal parapodia on both sides of nearly all body segments. The intensity of the Pn-vasa signal was strongest at the most posterior-region and gradually decreased along the mid-body until no signal was detected towards the most anterior-region (Fig. 2a–g). Interestingly, Pn-vasa was only detected in the superior notopodial ligule (SNL) of the parapodium (Fig. 2i). Histological examinations revealed that in the posterior-body region, Pn-vasa was strongly expressed in a population of cells in each parapodium (Fig. 3A, A’). In the mid-body region, the Pn-vasa signal was detected in cell clusters of various forms based on their location from the distal end of the parapodium to the coelomic cavity (Fig. 4A, A’). Most of these cell clusters had an elongated form with strong Pn-vasa signals throughout the entire cell (Fig. 4C–E). In the anterior-body region, Pn-vasa was detected in single cells (Fig. 5A’, arrows) that had strong Pn-vasa signals throughout the entire cell (Fig. 5A’, inset). Most of these cells were found in the coelomic cavity (Fig. 5A’). To determine the stages of Pn-vasa positive cells (Fig. 6a, d, g, j), we conducted a histological observation of the cells using hematoxylin and eosin stains (Fig. 6c, f, i, l). In the distal area of the parapodium, the big cell cluster (Fig. 6a–b) is composed of cells with condensed chromosomes and pink-colored granular-like structures (Fig. 6c). In the trunk area of the parapodium, the cell clusters had an elongated shape, while the cells inside the cluster also contained condensed chromosomes (Fig. 6f, i). In the coelomic cavity, the cells were larger than those cells in the parapodial area with no visible chromosomes in the nucleus (Fig. 6l). The corresponding sense control experiment is shown in Fig. 6e, h, k .
During embryogenesis, Pn-vasa mRNA was detected in the surface area of the fertilized egg (Fig. 7A, A’). It was then detected in the CD cell at the two-cell stage (Fig. 7B, B’) and in the D cell at the four-cell stage (Fig. 7C, C’). At 65 h post fertilization (hpf), Pn-vasa signal was observed in the posterior end of the larva (Fig. 7D; black arrow). At 72 hpf, we observed four somatic cell clusters in a spherical shape (Fig. 8A, asterisks) at the base of each parapodium in segments I and II (Fig. 8A). At the same time, we also observed the emergence of a Pn-vasa-positive cell at the posterior end of the larva (Fig. 8A, box frame). At 96 hpf, Pn-vasa positive cells were found closer to the somatic cell clusters (Fig. 8B, asterisks) in segments I and II. In 3-segmented nectochaete worms (6 days post fertilization, dpf), Pn-vasa was detected in the parapodia on both sides of segments I and II, at the exact place where the Pn-vasa-positive cells were found closer to the somatic cell cluster during the larval stage (Fig. 8C, D). No Pn-vasa signal was detected in the future peristomium segment (Fig. 8C, D). At this stage, we also observed the emergence of two Pn-vasa-positive cells positioned in the pygidium (Fig. 8C, C’). In 4-segmented nectochaete worms (8 dpf), four Pn-vasa positive cells were observed in the pygidium (Fig. 8D, D’) while two other Pn-vasa positive cells were found on both sides of the newly-generated segment (Fig. 8D, box frame; inset). In 8-segmented juveniles (10 dpf), Pn-vasa signal in the parapodia was stronger in the older segments (segments I and II) and became weaker towards the younger segments (segments III-VIII) (Fig. 9A). Another Pn-vasa signal was also observed in the anterior border of the pygidium aside from the Pn-vasa positive cells localized in the pygidium (Fig. 9A”, arrows). Pn-vasa mRNA was expressed in the parapodia, where signal intensity changed according to the growth of the segments. More intense signals were found in the younger parapodia of the posterior-body region and gradually decreased along the mid-body until a signal was undetectable in the anterior-body region. The strong Pn-vasa signal in the parapodia of the posterior region was due to the large aggregates of cell clusters (Fig. 3A’) in each parapodium. From the posterior to mid-body regions, these large cell clusters in the parapodia appeared to divide into smaller cell clusters (Fig. 4A, arrows C–E in Fig. 4A’). The more elongated form and the position of these smaller clusters are consistent with the idea that the clusters migrate from the distal areas of the parapodia to the coelomic cavity where they began the process of oogenesis (Fig. 4B–E). In the anterior-body region (Fig. 5A, A’), nearly all cell clusters in the parapodia had already disappeared, however, Pn-vasa signals were observed in single cells that looked like oocytes in the coelomic cavity (Fig. 5A’, arrows; inset). These series of observations may suggest that PGCs settle in the parapodium as a single cell, proliferate to form a large germ cell cluster (Fig. 3A, A’), separate from a large cell cluster into smaller clusters (Fig. 4A, A’) and migrate into the coelomic cavity to develop into oocytes (Fig.5A’). The existence of a germ cell production site in the Nereidid polychaete was reported in Pl. dumerilii  where one primary gonad was found located in the neck region. In contrast, in the present study, the large cell cluster with a strong Pn-vasa signal was observed in the parapodia of each body segment. The presence of these cell clusters in the parapodia may indicate the presence of a gonad of Pe. nuntia. Although the molecular mechanism underlying the difference in gonad location between these two closely-related species is not yet known, this may be morphologically related to the difference in their septum formation. In Pl. dumerilii, the incomplete septum  allows the translocation of PGCs to the neck region, and, subsequently, expansion of germ cells in the whole coelomic cavity as one common compartment . While on the other hand, Pe. nuntia has a complete septum between segments (Additional file 1: Figure S1), thus, each segment has to be equipped with sites for germ cell generation. The original settling area of Pn-vasa positive cells in each parapodium may act as the primary gonad of Pe. nuntia. It has been shown that the modes of maternally supplied vasa mRNA distribution in the early stages of embryo vary among animals [23, 30, 32–35]. Here, we observed that this mode also varies in a closely related species in polychaetes. In Pl. dumerilii vasa mRNA was uniformly distributed in early cleavage stages and later found in the micromeres, including the mesoblast 4D at 38-cell stage . In the present study, Pn-vasa signal appeared to be restricted in the surface area of the fertilized egg (Fig. 7A). This may be the area described as yolk-free cytoplasm in Pl. dumerilii . During the four cell stage, Pn-vasa mRNA was localized into the D cell quadrant, a similar pattern of expression observed in other polychaete species such as Tubifex tubifex . At 65 hpf, Pn-vasa signal was then localized at the posterior end of the larva (Fig. 7D, arrow). This posterior end was described as the MPGZ in Pl. dumerilii, where Pdu-vasa was also localized at 48 hpf . In Pl. 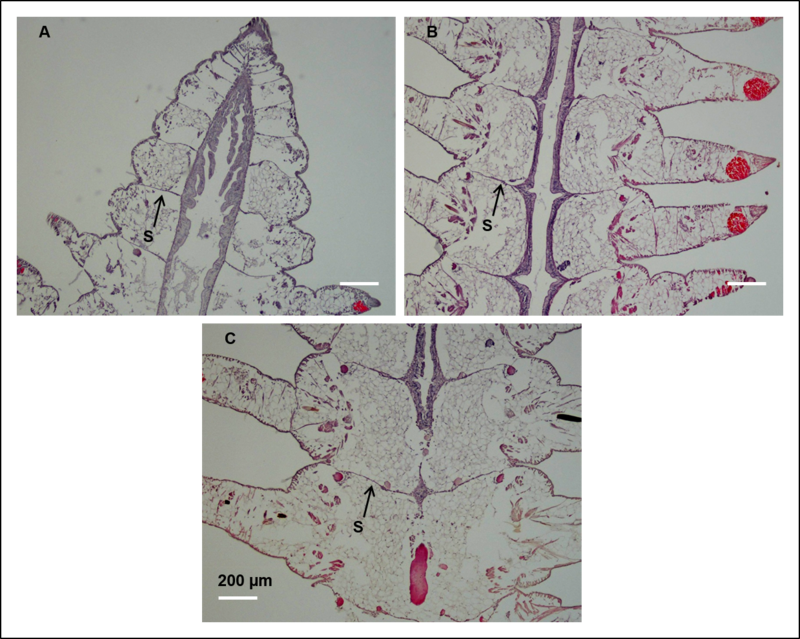 dumerilii, PGCs migrate from the MPGZ towards the primary gonad in the neck region during the late larval stage . In the present study, we did not observe any vasa signal in the neck region nor traversing cells with vasa signals from the posterior region (Figs. 8 and 9). Instead, we observed Pn-vasa positive cells located beside the somatic cell clusters at the anlage of the parapodia during the early larval stage (Fig. 8B, arrows). In 3-segmented nectochaete worms, two Pn-vasa positive cells were observed in the pygidium (Fig. 8C, C’). During the addition of a new segment, four Pn-vasa positive cells were observed in the pygidium (Fig. 8D, D’) while two other Pn-vasa positive cells were found in the newly-generated segment (Fig. 8D, arrows; inset). These observations may indicate that the Pn-vasa positive cells divide in the pygidium and daughter cells are supplied to both parapodia of the newly-generated segment. In many animals including polychaetes, vasa has been reported to express in the somatic stem cells [22, 27, 40–42] which has led to a hypothesis that both PGCs and stem cells share some common molecular signatures [40–44]. In Pl. dumerilii, Pdu-vasa was shown to express in these two distinct cell populations: PGCs and somatic stem cells, in the MPGZ during the larval stage [13, 42]. This MPGZ was also described as the segment addition zone  or segment/pygidium boundary  in other reports. Only PGCs from this zone migrate to the neck region and form the germline of Pl. dumerilii . Whereas somatic stem cell populations are believed to be responsible for the formation of new segments . In the present study, we also observed Pn-vasa signals in the boundary area between the newly-generated segment and the pygidium during the juvenile stage in addition to Pn-vasa positive cells localized in the pygidium (Fig. 9). With this observation, we hypothesize two possible mechanisms for the appearance of Pn-vasa positive cells in the parapodium. One possibility may be that Pn-vasa positive cells from the pygidium migrate to the MPGZ and settle in the parapodium of the newly-generated segment. The MPGZ may act as a queuing area for Pn-vasa cells and may double as an area for somatic stem cell populations to generate new segments. A second possibility is the spontaneous emergence of Pn-vasa positive cells in every new segment without translocation of germ cells from the pygidium. To confirm our hypothesis, we need to perform a more detailed histological observation and analysis using other molecular markers to determine the identity of the cells. This study proposed a new mechanism for germ cell development in every segment separated by a complete septum in Pe. nuntia. Pn-vasa was found to express in the cells of the pygidium suggesting that these cells serve as the main source of germ cells. These germ cells are then supplied to every newly-generating segment. This is different from the previously reported mechanism of gamete production in Pl. dumerilii. The difference in the gamete production pattern of these two homonomous segmented species appears to be related to the presence or absence of a complete septum between segments (Fig. 10). These results provide a fundamental basis for the understanding of the evolutional change in gamete production of polychaetes. We thank Mr. Yasunobu Masuo, the polychaete hatchery owner in Oita Prefecture, Japan for sharing his instruction and technical expertise on the proper handling and keeping of the animals used in this study. We also thank Mr. Vladimir Greshishchev for his time and contribution in editing the manuscript. MMP and MY designed the experiment; MMP and GP Jr. performed the experiment; MMP, YK, GP Jr. and MY analyzed the results and wrote the manuscript. All authors read and approved the final manuscript.